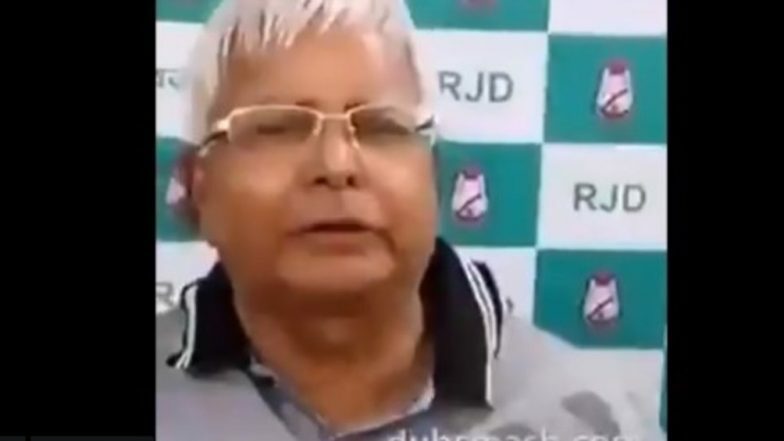 Patna, April 14: Jailed Bihar politician and Rashtriya Janata Dal (RJD) chief Lalu Prasad Yadav on Saturday shared a dubsmash video of Prime Minister Narendra Modi's poll promises that he made during 2014 general elections. The RJD chief shared the video on his Twitter and Facebook handle. The video tried to induce humour to the heated up political campaigning in Bihar by mocking PM Modi's "acche din (Good Days)" promise. In the 17-second video, dressed in a grey t-shirt, the former railway minister can be seen lip-syncing Narendra Modi's acche din slogan from a 2014 rally speech. "Hindustan ke ek ek gareeb aadmi ko muft mein 15-20 lakh rupaye mil hi jaayenge (Every Indian will get Rs 15-20 lakh for free)," PM Modi was heard saying in the recording as RJD chief lip-syncs him. 'I Miss Lalu Ji', Says Rabri Devi; Appeals Tej Pratap Yadav to Return Home. The video captioned "Muft mein lelo 15 lakh, acche din aur jumla" also included PM Modi "bhaiyo aur behno" phrase and "depositing Rs 15 lakh in the bank accounts of every Indian" promise. It is not yet clear when the video was shot but it was published on Saturday. India Is Under Undeclared Emergency, Says RJD Leader Lalu Prasad Yadav. Lalu Prasad Yadav is currently serving jail term in the fodder scam in Jharkhand's Ranchi. Earlier, His bail petition was rejected by the Supreme Court. Meanwhile, elections in 40 Lok Sabha seats in Bihar will be held in seven phases from April 11- May 19. The counting will take place on May 23.